This is a list of Norse gods and goddesses that are in Norse mythology. Divided between the Æsir and the Vanir, and sometimes including the jötnar (giants), the dividing line between these groups is less than clear. However, it is usually accepted that the Æsir (including Óðinn, Þórr and Týr) were warrior gods, while the Vanir (mainly Njörðr, Freyja and Freyr) were fertility gods. Various other groups of beings, including elves, dwarves and jötnar were probably minor gods, and might have had small cults and sacred places devoted to them. Bragi - God of poetry,music and the harp. Consort: Iðunn. Dead, killed in the Dwarven tusk boar battle at Ragnarok. Búri - The first god and father of Borr. Dagr - God of the daytime, son of Delling and Nótt. Delling - God of dawn and father of Dagr by Nótt. Forseti - God of justice, peace and truth. Son of Baldr and Nanna. Fitch - God of ruling and arbitration. Son of Eir and Gmot." Freya - Goddess of love, fertility, and battle. Consort: Óðr. Committed Suicide during Ragnarok. Freyr - God of fertility. Consort: Gerð. Dead, killed by Surtr in Ragnarok. Gmot - God of the moon. Brother of Re`es and Weth. Gefjun - Goddess of fertility and plough. Hel - Queen of Neifelheim, the Norse underworld. Heimdallr (Rígr) - One of the Æsir and guardian of Ásgarð, their realm.. Killed by Loki. Hermóðr - The heroic son of OdinTried to rescue Balder. Hlín - Goddess of consolation and protection. Höðr - God of winter. Killed by Vali. Hœnir - The silent god. Iðunn - Goddess of youth. Consort: Bragi. Jörð - Goddess of the Earth. Mother of Þórr by Óðinn. Kvasir - God of inspiration. Killed by Dwarves. Lofn - Goddess of forbidden loves. Loki - Trickster and god of mischief . Consort: Sigyn (also called Saeter). Killed by Heimdall. Magni-god of strength.Son of Thor. Máni - God of Moon. Mímir - Óðinn´s uncle. Decapitated by Vanir. Nanna - An Ásynja married with Baldr and mother to Forseti. Died because of Baldur's death. Nerþus - A goddess mentioned by Tacitus. Her name is connected to that of Njörðr. Njörðr - God of sea, wind, fish, and wealth. Killed in Ragnarok. Nótt - Goddess of night, daughter of Narvi and mother of Auð, Jörð and Dagr by Naglfari, Annar and Delling, respectively. Odin The "All Father" (The Ruler of the gods). Swallowed by Fenrir. Sága - An obscure goddess, possibly another name for Frigg. Sif - Wife of Thor. Sjöfn - Goddess of love. Skaði - Goddess of winter Njörðr's wife. Snotra - Goddess of prudence. Sol (Sunna) - Goddess of Sun. Swallowed by Skoll. 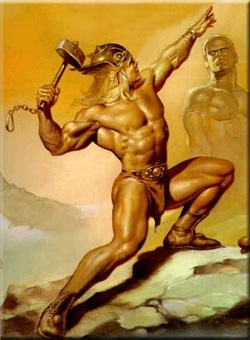 Thor (Donar) - God of thunder and battle. Consort: Sif. Killed by Jormungandr. Tyr- God of war. Also the god of the skies. Killed by Garm. Ullr - God of skill, hunt, and duel. Son of Sif. Váli - God of revenge. Vár - Goddess of contract. Vé - One of the three gods of creation. Brother of Óðinn and Vili. Víðarr- Son of Odin and the giantess Gríðr. Vör - Goddess of wisdom.